On paper, the career records of the two Democrats on the ballot for state Assembly in the 15th District offer East Bay voters a difficult choice. As a two-term city councilmember, Jovanka Beckles helped lead the effort to break Chevron's influence on Richmond City Hall, while achieving progressive victories on rent control and minimum wage. Buffy Wicks was an early architect of Barack Obama's presidential campaign who worked in the White House to help pass the Affordable Care Act. But voters in the heavily Democratic I-80 corridor in north Oakland, Berkeley and Richmond will likely be doing more than parsing the resumes of Beckles and Wicks. They'll be weighing policy visions from two different camps of California's Democratic Party and, more starkly, choosing between two different styles of pursuing those goals. 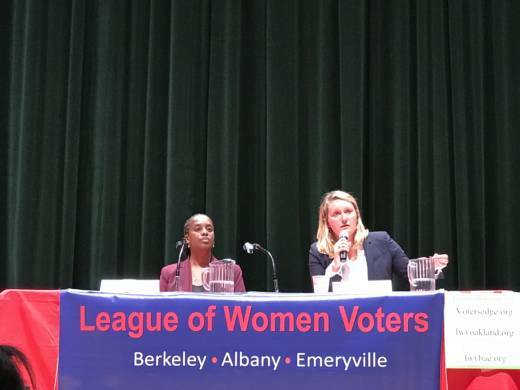 The two candidates' influences and approaches were on display this past week, when Wicks and Beckles met in a League of Women Voters candidate forum in Berkeley. Just before the close of the forum, both were asked for politicians that they admire. Beckles mentioned U.S. Sen. Bernie Sanders from Vermont and Oakland U.S. Rep. Barbara Lee, while Wicks chose Obama and Sen. Kamala Harris. The state's top-two primary has allowed fissures between traditional Democrats like Wicks and a Democratic Socialist like Beckles to extend into the general election. Even more striking than the different shades of blue on display in this race are the expressly different political styles employed by Beckles and Wicks. Wicks laid out a vision for building on recent achievements by the Democratic supermajority in the state Assembly. She says she hopes to "go to Sacramento and to work with a broad base of folks to build a coalition." Beckles argued that bold legislative policy can happen without undue compromise. "Small, incremental change is not the way forward," she said. The difference is evident in how Wicks and Beckles viewed two of the most controversial pieces of legislation of the past session: bills to extend the state's cap-and-trade emissions market, and another to end cash bail for suspects awaiting trial in California. To Beckles, the deals were marred by concession. In the case of cap-and-trade, she says the deal put shackles on the ability of local air districts to regulate pollution. And she says bail reform came with the costly price of giving judges more power over pre-trial detention. "I don’t believe replacing one racist system with another racist system is progress," she said. Wicks called both deals a "step in the right direction" for California, helping the state maintain a leadership role nationally on climate change and criminal justice policy. The divergent approaches have helped inform the candidates' split on one of the most controversial issues in their race: Proposition 10, the November ballot measure that would allow for the expansion of rent control in California. The 15th District is one of the few in California with three cities that already have rent control policies on the books — Oakland, Berkeley and Richmond — suggesting it could be a ripe laboratory for the expansion of rent control should Proposition 10 pass. Beckles has whole-heartedly supported Proposition 10, tying her campaign closely with the Yes on 10 effort. She sees the measure as the kind of bold solution required in times of skyrocketing rents. Wicks, who initially did not take a position on Proposition 10, said she opposes the measure, after careful deliberation of the unintended consequences that could result from price controls. "I’ve spoken to folks who build affordable housing, affordable housing experts," she said. "They are concerned that this will exacerbate our housing crisis by halting the construction of new homes." Instead, Wicks said she would support a reform to the state's rent control ban, allowing new units to become eligible for rent control after a certain number of years — an approach being pursued by the city of Berkeley. Beckles closed her pitch to the hundreds of voters at the forum with the populist vigor that has propelled her campaign. She railed against the monied interests she contends are standing in the way of landmark change at the state Capitol, with a not-so-subtle dig at the vast fundraising advantage Wicks has held throughout the race. “We can open the door to more billionaires, for-profit control of our state government," Beckles said, "or we can elect a champion for working people who will never take one cent from the billionaire class." Wicks, buoyed throughout the forum by her mastery of policy detail, maintained that she was uniquely suited to get to work on important legislation from day one in Sacramento. She promised to deliver for the district by leveraging relationships with powerful committee chairs and the potential next governor, Lt. Gov. Gavin Newsom, who has endorsed her campaign. "This district deserves someone who wants to be in a leadership role in Sacramento," Wicks said. "I’m going to go to Sacramento and not just vote the right way, but fight the right way, and lead the right way." After a grueling, 12-candidate primary and a vigorous campaign, Wicks and Beckles have left voters with a clear choice of how they’d like to see their policy priorities pursued in the state Capitol.